Tech jobs are particularly desirable, because they pay well, show long-term signs of growth and are less vulnerable to automation. But women have faced systemic difficulties in getting these jobs. And even when women do find jobs in the tech world, they earn 84% of what men in tech do, according to Census Bureau data, and thus have less opportunity to save. This is true at the national level, but there are some cities where parity between men and women in tech is less of a concern. Below, we rank the best cities for women in tech. To do this, we looked at four factors. Specifically, we analyzed data on the gender pay gap for women in tech, income after housing for women, women as a percent of the tech workforce and the percent change in tech jobs. To see where we got our data and how we put it together to create our final rankings, check out our data and methodology below. This is SmartAsset’s fifth annual study on the best cities for women in tech. Check out the 2018 version here. 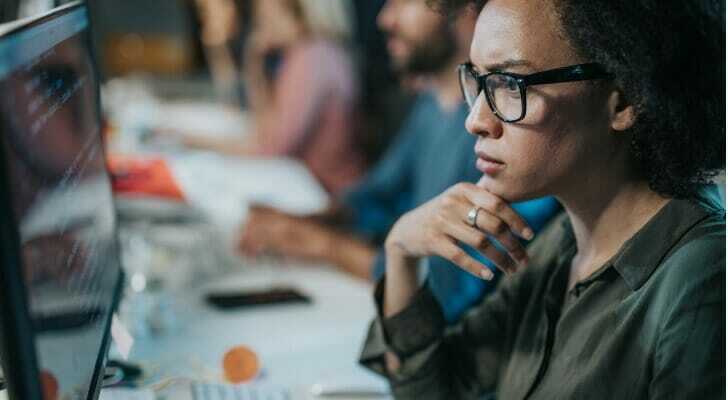 The top holds, with a twist – Washington, D.C.; Baltimore, Maryland; and Philadelphia, Pennsylvania continue to three of the best cities for women in tech. But Houston, Texas and Arlington, Virginia did manage to slide into the top five, a change from last year. The Bay Area is middle of the pack – The nation’s most famous area for tech, the Bay Area, is a fairly mediocre spot for women in tech. The California cities San Francisco, San Jose and Oakland all rank 28th or worse. Washington, D.C. has, for a few years now, been a great landing spot for women in tech. The pay gap for women in tech here is small. On average, women in the tech workforce here are paid 95% of what men are. Perhaps the statistic most worth highlighting is the proportion of women who work in tech. They make up nearly 39% of the workforce, the second-highest rate in the study. Baltimore, a city near the nation’s capital, is also great for women in tech. The gender pay gap here is fairly low, at 93%. What’s more, women make up almost a third (31%) of the tech workforce. Women with an eye on the future will be happy to hear that tech jobs here grew by 28% from 2014 to 2017. Baltimore ranks ninth in that metric. 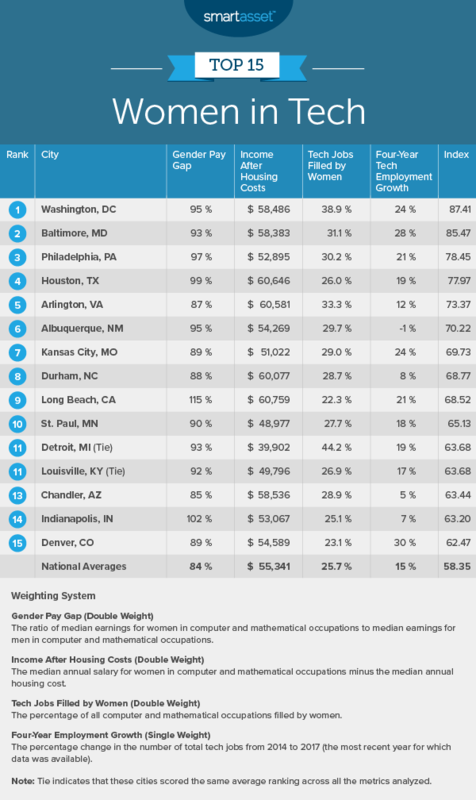 Philadelphia has an even smaller tech pay gap than the cities ranked above. On average in Philly, women in tech earn 97% of what men in tech do. Only three other cities can beat that score. Women also make up about 30% of the tech workforce. That may not sound like a lot, but it beats out the vast majority of cities. If the City of Brotherly Love wants to climb into the top two spots, income after housing will need to rise here. This city ranked 24th for income after housing for women in tech. The motivations for working in tech are varied, but certainly one reason to be a tech worker is the pay. In Houston, the average female tech worker has about $60,600 left over after paying for the average home. In that metric, this city ranks eighth. That pay also means male and female tech workers are paid nearly identical amounts. For gender pay gap, Houston ranks third. Arlington stands out for its large proportion of female workers in the tech sphere. Roughly one-third of all the tech workers here are women, the fifth-highest rate in the study. The pay here for women is also pretty good. After factoring in housing costs, the average woman in tech has nearly $60,600 leftover. One concern women may have is the fact that pay in tech is fairly unequal in Arlington between men and women. Women in tech make only 87% of what men in tech do. Albuquerque, New Mexico’s tech hub for women, takes sixth. This city has a tech gender pay gap of 95%, which is the seventh-lowest in the study. Women also make up nearly 30% of the tech workforce, which is the 10th best rate in the country. Albuquerque is dragged down the ranks a bit as a result of the relatively stagnant growth in tech jobs here. Women make up a large chunk of the Kansas City tech workforce. Roughly 29% of all tech workers in Kansas City are women. That’s good enough for the 11th-highest rate in the study. Kansas City also ranks in the top 20 for tech employment growth and gender pay gap. Only the relatively disappointing income after housing metric lets Kansas City down. Durham saw poor tech job growth relative to other cities. But that should not scare tech women away. Durham has the 20th-lowest tech gender pay gap, the 11th-highest income after housing for female tech workers and the 13th-highest rate of women working in tech. Women don’t make up a large portion of the Long Beach tech workforce, but women who work in tech in Long Beach sure are paid a lot. In fact, women in tech here are paid more than their male peers. Long Beach ranks first for gender pay gap. Those high incomes also leave Long Beach female tech workers with healthy incomes, even after paying for housing. Long Beach ranks seventh for income after housing. St. Paul ranks in the top 15 for only one of our metrics: It lands at 12th for gender pay gap. But while it doesn’t hit the heights in any single metric, it also won’t leave women in tech with much to complain about. St. Paul ranks no worse than 33rd in any single metric — in the income after housing data point — and ranks in the top 20 in two metrics. Women make up more than 44% of the tech workforce in Detroit. In that metric, Detroit tops the list. Women in tech in Detroit are also paid a healthy amount compared to men: The gender pay gap is minimal here, as women in tech make 93% of what men in tech do. In that metric, Detroit also ranks in the top 10. Louisville ranks in the top 20 for gender pay gap and women as a percent of the tech workforce. Unfortunately, the tech scene in Louisville doesn’t deliver robust salary rewards for its workers relative to some aspects of the cost of living here: Louisville ranks 31st for income after housing. Chandler has the 12th-highest income after housing for women in tech. This city also ranks 12th for women as a percent of the total tech workforce. Roughly 29% of tech jobs in the city are filled by women. Indianapolis is a great city for women working in the tech field looking for some semblance of equality. On average women and men in tech are paid nearly the same amounts, and more specifically, Indianapolis ranks second for gender pay gap. Thanks to affordable housing costs, the pay in Indianapolis also goes pretty far for women in tech. Indianapolis ranks 22nd for the income after housing metric. Denver ranks in the top 20 for three different metrics. Specifically, Denver has a gender pay gap of 89%, income after housing for women equal to $54,589 and tech job growth of 30% over the time period we analyzed. Denver fell to 15th, because women make up just 23% of the tech workforce, the second-lowest figure in the top 15. Gender pay gap in the tech industry. This is the average earnings for women who work in tech as a percent of men’s average earnings. Data comes from the Census Bureau’s 2017 5-year American Community Survey. Income after housing. This is the average earnings for women in tech minus median housing costs. Data for earnings comes from the Census Bureau’s 2017 5-year American Community Survey. Data on housing costs comes from the Census Bureau’s 1-year American Community Survey. Women as a percent of tech workforce. This is the percent of all tech jobs held by women. Data comes from the U.S. Census Bureau’s 2017 5-year American Community Survey. Tech employment growth. This is the percent change in tech jobs from 2014 to 2017. Data comes from the Census Bureau’s 2014 5-year American Community Survey and the Census Bureau’s 2017 5-year American Community Survey. After ranking each city in each metric, we found each city’s average ranking, giving tech employment growth a single weighting and all other metrics a double weighting. Using this average ranking, we created our final score. In our index, from 100 to 0, 100 represents a hypothetical city that ranks first in all metrics and 0 represents a city that ranks last in all metrics. We scored all 58 cities according to how they stacked up to the potential ideal score. Upgrade your savings account – Tech workers should not have too much trouble finding a way to steer some of their earnings to their savings account. But in order to make their savings go as far as possible, even tech workers need to have the right savings account. Online-only savings accounts at Ally and Synchrony have annual percentage yields (APYs) multiple percentage points higher than those at brick-and-mortar institutions. Get the best advice – Your finances are the cumulative result of years of hard work, so why not make the most of your earnings by taking the advice of a trusted financial expert? A financial advisor can help effectively manage your finances. If you are not sure where to find a financial advisor, check out SmartAsset’s financial advisor matching tool. We’ll pair you with up to three financial advisors in your area who can best meet your needs.